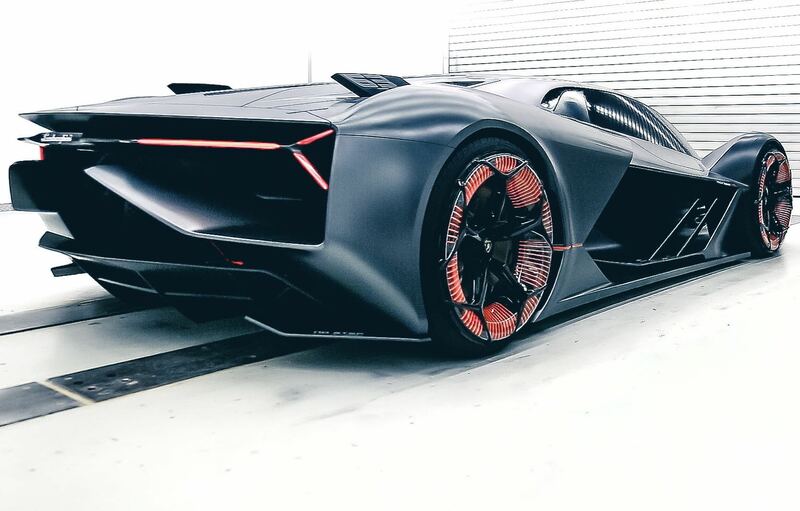 Lamborghini has revealed the Terzo Millennio concept at EmTech, the Massachusetts Institute of Technology’s in-house tech conference. The Terzo Millennio - meaning third millennium - is all-electric, with in-wheel motors providing power, and the ability to control how much torque each wheel has. Lamborghini has not specified how much torque the motors produce, however. Two main focuses are present - next-generation energy storage systems and future innovative materials. Lamborghini worked with two separate MIT labs on the two, financing the projects itself. The former is worked upon by the Dinca Research Lab, named after and led by chemistry professor Mircea Dinca, while the latter is dealt with by the Mechanosynthesis Group, with by mechanical engineering professor Anastasios John Hart leading the department. A kinetic energy recovery system is also used, to give extra power to the lightweight supercar, and a super capacitor is planned for the model, although the brand admits that battery technology is not currently where it needs to be. It aims to develop a super capacitor for a leap in power density. MIT isn't working on this element, however. Structural components double up as the car’s battery pack to shed weight - another area where Lamborghini alleges the current technology isn’t up to scratch. The rest of the car is made of carbon fibre, although sensors allow the car to monitor the structural integrity of its own body, detecting damage and cracks in the bodywork. The car can then 'self heal', thanks to chamicals in the micro-channels of the carbon fibre bodywork. Lamborghini's work with MIT looks to develop new and alternative methods of producing carbon fibre. Without a traditional four-wheel drive drivetrain running the length of the car, Lamborghini was able to design the car’s body to suit aerodynamics. This is another area highlighted for further development, as is the sound of the car. “The adoption of an electric power train requires to define a sound able to substitute the one of today’s V12,” Lamborghini admits, although it does not go so far as to explain what kind of sound will be produced by the concept. The only detail about the interior is the car's virtual cockpit, which allows the driver to be virtually taken around famous circuits, and through augmented reality, follow a 'ghost car' akin to racing video games. This unit gives us some clues to how the next LP 800 could look? Probably. Just as the Reventon did give hint's about the Aventador LP700. Lovely vehicle for the future beyond 2030. Capacitors increase power density, not energy density. Seems a bit unnecessary though when you look at how much power Nio and Rimac's batteries put out. Also, I'm glad to hear they're looking into fiddling with the aural characteristics of an electric powertrain. McLaren mentioned something similar a while ago. There's quite a bit of scope - most hybrids make a quiet Star Trek noise, Teslas tend to be virtually silent, Rimac's Concept One sounds like a banshee from the inside, and Formula E cars have a high whirr to them. There must be more options possible to create something befitting of an exotic, preferably from the outside as well as the cabin. It's just that nobody's really had reason to try yet. I'd theorise potential in having a bank of dumb rotors attached to the main motor, which don't generate any power but do make noise, and having a firing order to tailor the vocal characteristics. Throw in a multi-speed gearbox to prevent the sound being one long ascension, and add acoustic channels directly from the motors to the cabin and exterior, and that might do the trick. A similar hypercar styling concept which Aston Martin did a few years ago. The headlights posess nuances of that Aston concept and the McLaren 720S while the sides, a bit like the Aston Valkryie. The rear looks nice. It is nice that Lamborghini admits that battery component technology is not up to scratch. It seems electrification may take some time to arrive in the form of the next-gen Huracan and Aventador. Every concept car is like a car from the future. Design and specifications are not real. I understand that, but this car still confuses me. I don't dislike this car. But I'm confused. Under what circumstances can this concept car with zero ground clearance be translated into a production model? It looks good for lamborghini working with MIT, but the reality is they are only investing 220k dollars a year into the program, less than the cost of one of their cars which isn't going to generate much in terms of technological development, but will pay for a couple of professors research bursaries. Lamborghini arent going to be a major player in battery electric tech as they're a niche perfoamnce manufacturer and will effectively have to run with what the VW group develops, though they may get some of the group tech to showcase first, which effectively means this cant be taken for much more than a concept car to show off some future styling cues with a top university name thrown in for extra publicity / credibility. Fortunately, since electric cars are a doomed plot by lefties attempting to take freedom of movement away from the people, we'll never have to suffer seeing this repulsive bleeder on the roads.